Makoto also comes to visit Ryu’s gave and the Mysterious Man seems to recognize him. Takeru heads downstairs to the lab where he finds his father standing in front of the Monolith. Takeru says he won’t hesitate anymore and will do as he said, to study the souls of luminaries and open the eye of his own soul. He will attain true strength and come back to life. Takeru heads outside and trains, now with a stronger resolve. Akari feels very nostalgic. Takeru and Makoto would always train out here when they were kids. Takeru remembers his Makoto-niichan. He flashes back to one of those face-offs. Akari and Makoto’s sister cheer them on. 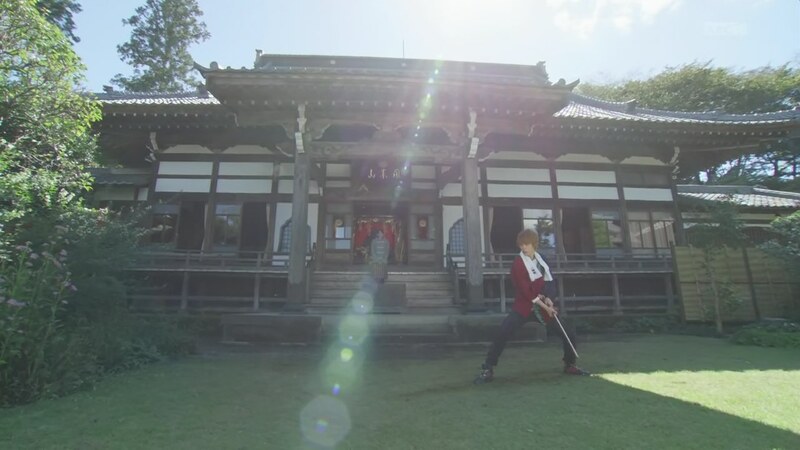 But Takeru falls and Makoto is about to take the winning hit with the newspaper sword. Takeru asks for a time out. Akari wonders what happened to Makoto after disappearing ten years ago. Takeru heads down to the lab looking for Grampa Sennin, but he’s not there. Instead, Takeru sees a lantern and a clock with notes saying they are both awesomely useful. 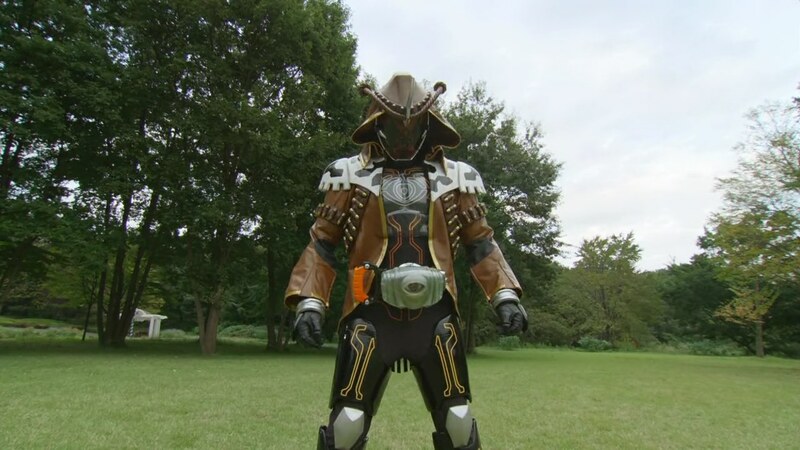 Takeru isn’t really sure how either are awesome, but Grampa Sennin has at least left a clue to the next Eyecon: Billy the Kid. Akari takes the note and puts it on a whiteboard using Kamen Rider Drive and Ghost magnets. Onari comes running down to tell them they have a case. Tanaka Tsuneo describes how his BFF, Tomonori, has changed after not seeing each other for a year. They lived in the same apartment since they were born and stayed best bros even after he moved. But now Tomonori isn’t responding to their secret bro handshake. Tsuneo thinks he might be an impostor. But not only that, the others in their building have also been acting strange. They all gather and go someplace at night. Tsuneo tried following, but he’d always lose them thanks to strange phenomena. Just then, Shibuya and Narita come in with info on the Mysterious Man heading to a Western shop. Onari says they should focus on this immediately. “What about my request?” Tsuneo asks. Takeru says he’ll go with Tsuneo while Onari and Akari check out the strange man. He tells them to take Grampa Sennin’s clock and lantern with them just in case. 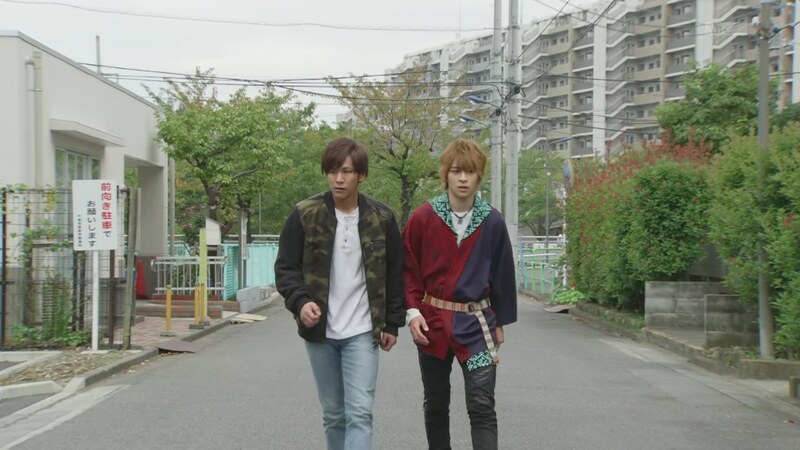 Tsuneo takes Takeru to the apartment building. He hopes Takeru can help his childhood friend. That makes Takeru remember his own childhood friend Makoto. Tsuneo listens, realizing Takeru’s gone through the same thing. But Takeru says he’s sure Makoto is okay. For now, they should focus on Tomonori. As they walk down the road, the apartment dwellers creepily watch them from their balconies. Tomonori comes walking by and Tsuneo shows Takeru how his BFF disregards the handshake. Tomonori coldly brushes Tsuneo off. Takeru thinks they are all being controlled by Ganma. Just then, Takeru and Tsuneo get blown away by some strong gust. Tsuneo gets knocked into a fence. 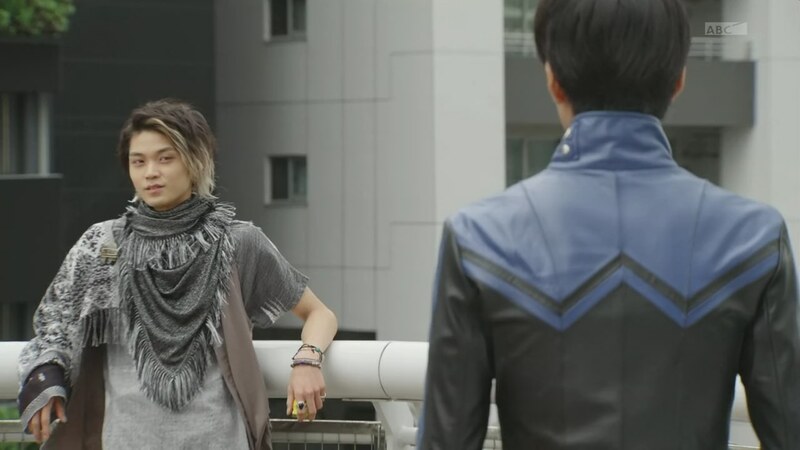 Takeru sees the bee-looking Ganma who tells him no to trespass on her community. Takeru henshins and they fight. 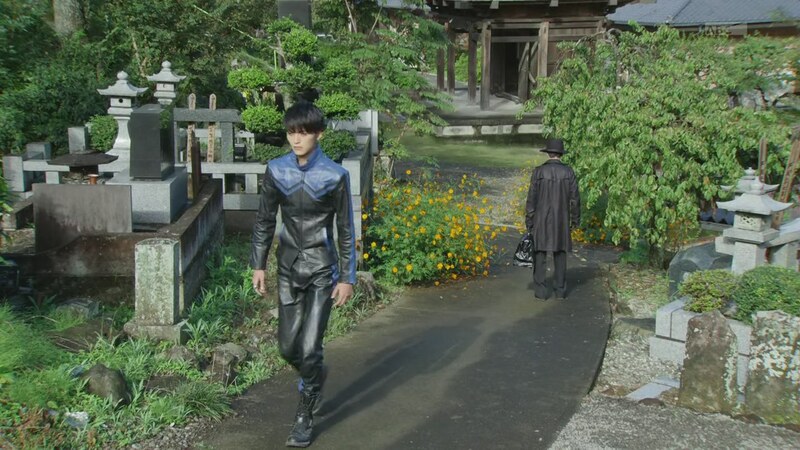 But Specter arrives and takes on Takeru, allowing the Ganma to leave. “Specter” asks if Takeru’s made his decision. But Takeru says it’s been the same ever since. He will protect everyone and come back to life. Takeru goes Musashi while Makoto goes Nobunaga. They spar a little. Takeru downhenshins and believes in himself with an Omega Drive. Makoto also unleashes an Omega Drive and the attacks result in a draw. Makoto acknowledges Takeru has grown stronger, but he will not allow him to get in his way. Tsuneo calls for Takeru and Makoto leaves. Tsuneo says everyone’s gone, including Tomonori. Takeru tells him to stay here while he tries to pursue. Makoto is by the water and thinks about Takeru’s words, the same words he said when they were kids. His sister asks him what he’s thinking about, but he doesn’t say. That’s when the Mysterious Man appears. He introduces himself as Saionji and says he is helping Aran. Makoto wants answers. His sister asks what’s happening and Saionji realizes she’s in the Eyecon. Makoto is pissed. Saionji leaves. The wheels start to turn in Makoto’s head. He flashes back to him and his sister, Kanon, getting sucked into the Ganma world through a portal at the Monolith. Makoto meets with Aran/Alan and asks who Saionji is. Aran says Saionji is just helping him. Makoto asks if Aran knows what happened ten years ago, but he says no. 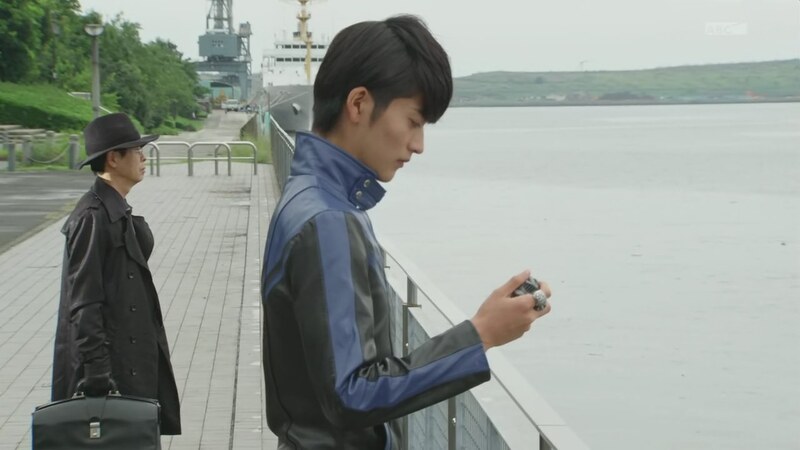 Anyway, Aran thanks Makoto for letting him borrow the Edison Eyecon and returns it to him since research is going well and he knows it is of much more use to Makoto. Across town, Saionji has arrived at the Western shop and presents Billy the Kid’s hat to the shop owner. Onari and Akari are also there and watch from outside as the hat begins to glow. Saionji draws an eye and Billy the Kid’s ghost appears and flies around. 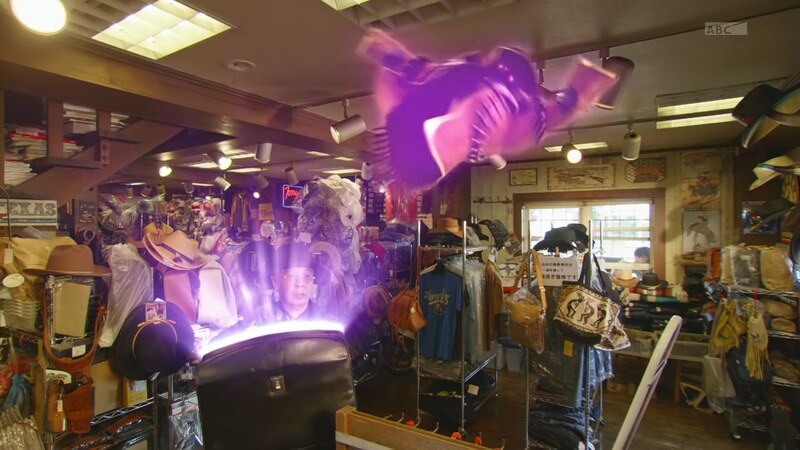 Saionji opens his bag and it pulls the ghost into some device which transforms it into an Eyecon. Saionji leaves. Onari and Akari follow him to some abandoned warehouse. Akari uses the lantern to light their way up the stairs. Once Saionji stops in a large room, Onari steps out and confronts him. 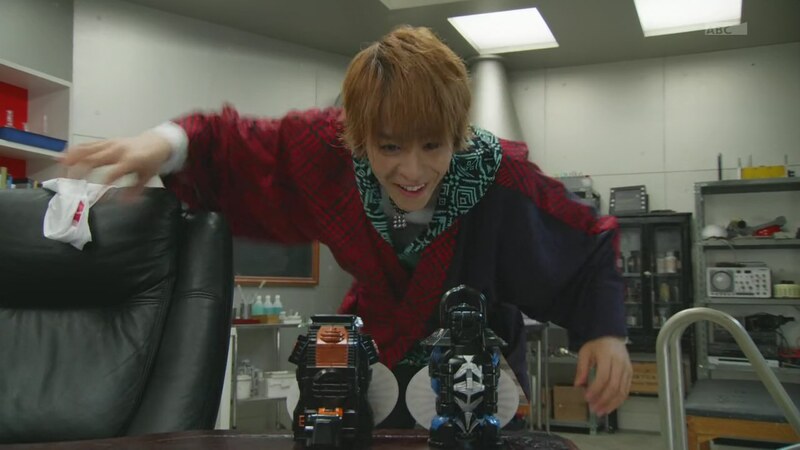 He trips on a chair and falls on Saionji, knocking the Billy the Kid Eyecon out of his hands. Onari is able to grab it. 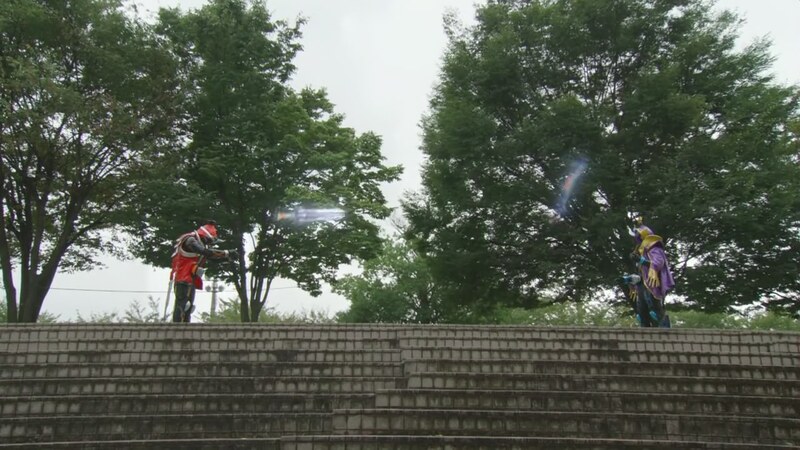 But Saionji tosses two Eyecons in the air to summon two Ganma. The lantern Akari still holds starts to shine very bright. It forces the Ganma to become visible. Onari and Akari do their best to stay away from the attacking Ganma. Grampa Sennin’s clock starts ringing like a church bell and Akari pulls it out. The clock turns into a bat that emits a soundwave that temporarily distracts the Ganma and Saionji long enough for them to leave. Onari and Akari follow the clock bat to Takeru. Takeru has found Tomonori and the apartment dwellers and tries to get them to stop. He sees something on their necks is what is controlling them. He uses his sword to chop them all off the people, except Tomonori who runs off. The Ganma appears and Takeru henshins. They battle a while before Takeru goes Musashi. But the Ganma splits herself into hundreds of little bees. 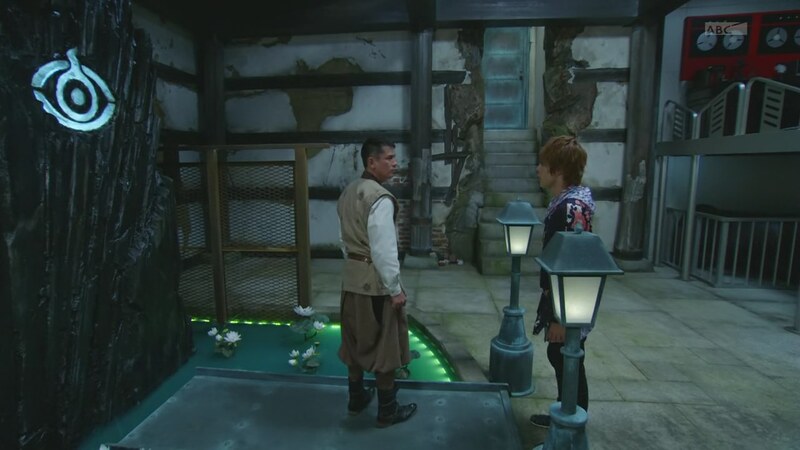 Onari and Akari arrive and they use the lantern to make Takeru and the Ganma bees visible. 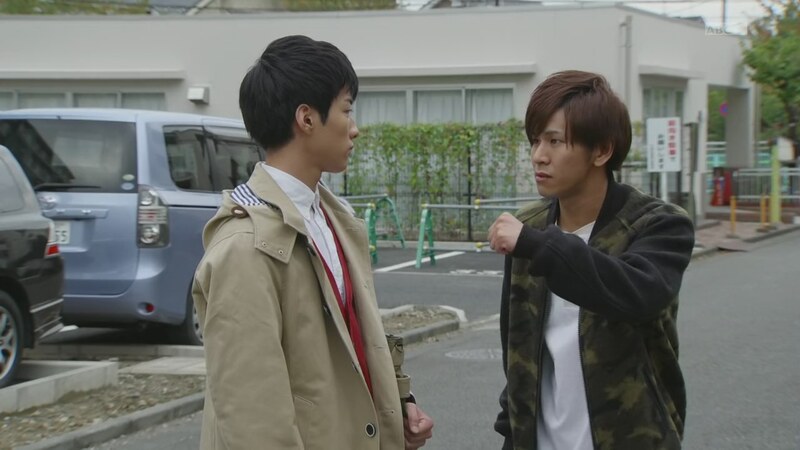 Akari takes the Eyecon from Onari and tosses it to Takeru. Takeru uphenshins to Billy the Kid. The clock bat becomes a gun. Takeru forces the Ganma back to her full-bodied form. Yurusen pops in and tells Takeru to combine his guns to become a rifle. Takeru tries an Omega Impact on the Ganma and thinks he’s got her finished. The two Saionji-summoned Ganmas have Onari and Akari. Yurusen points Takeru to the bee Ganma still being alive and has now fused with an entire construction site. Yurusen calls for Captain Ghost and Takeru hops onto Iguana Ghostriker. I don’t know if I really liked how they revealed pretty much everything this episode. It all felt very abrupt. Like middle-30 Drive-level abrupt. Especially when the very first scene is of the Mysterious Man revealing a connection to both Papa Tenkuuji and Makoto. That was an end of episode cliffhanger type of thing I think. Then we get Takeru and Akari conveniently remembering they had childhood friends who disappeared just as Saionji reveals himself to Makoto. And of course the case of the week is of childhood friends. I feel like there is at least 2-3 episodes worth of stuff here. They could have built up that friendship a little more other than just dropping the few lines about Makoto knowing Akari. I know Makoto’s name actually hasn’t been said in the show yet until this episode. But even then, it is kind of odd that neither Akari or Takeru recognize him even just a little bit. I mean, Saionji even recognizes him first time he’s a foot away. And then there’s the insinuation that the Ganma holes are somehow because of Papa Tenkuuji and Saionji. And Saionji has a machine that makes Eyecons. And Aranalan has some blob somewhere. It really was a lot of stuff crammed into this episode. Like some big data dump or something. I wish it were done a little slower since the show has been moving pretty well the first six episodes. The Eyecon collection obviously won’t take the whole 50 episodes. And there’s likely several arcs. So the hope is that they have plenty of story to cover. But if there’s some really bad fillers in the future, then I’m going to look back at this episode and ask myself what they were thinking. Anyway, I definitely liked seeing more about Makoto at least. And also see him actually with lines and more emotion. Aranalan also has gotten a chance to show more personality after the first couple of episodes had him just leering from trees. Also great to see Onari and Akari actually doing stuff that mattered and not just run around screaming. While everything was too sudden and I feel like they could’ve introduced the developments differently, I do like the actual developments themselves. Very interesting stuff with plenty of potential. 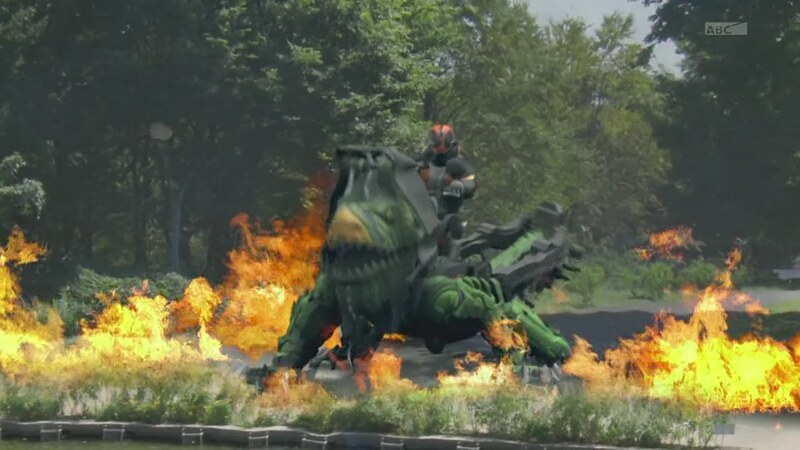 ← Recap: Mahou Sentai Magimagiger, Episode 38 – "The Little Witch Loves Yakumo?" But man, this episode definitely poured in the plot. I’m assuming that Takeru and Akari not recognizing Makoto is mainly due to the years of separation. It’s not like they were able to see him from time to time after he disappeared, and ten years is definitely a long time which can cloud the memory. Of course, that still doesn’t answer why Makoto knows them. Bit his backstory is indeed interesting, kinda like a Haruto 2.0 gone horribly horribly wrong. Still, this one just made me even more interested in how the series’ story does have a lot of material within it.